← Is it Safe to Go Birding in Mexico? Summit County, Colorado isn’t Capistrano, but summer visitors here in the rarified air of our high mountains might identify with that song about birds and spring on the California coast. The song’s lyrics lament a lover’s departure the day migrating Cliff Swallows left San Juan Capistrano, and long for her promised return with the swallows the following spring. First recorded by the Ink Spots, the song was a hit and the swallows returned on schedule, but it isn’t clear if the lover came back. Maybe the song was written by a jilted birder. Regardless, you don’t have to migrate to Capistrano to see Cliff Swallows; we’ve got plenty right here in Summit County. In fact, we’ve got plenty of four other swallow species, too. 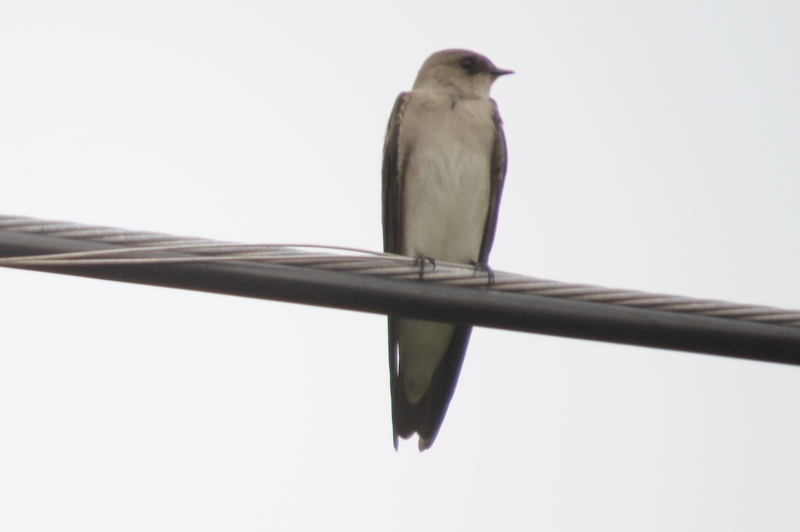 North of the Mexican border, there are nine species of swallows, and five of these are common summertime breeders in Summit County. In addition to Capistrano’s Cliff Swallows, we can find Northern Rough-winged, Barn, Violet-green and Tree Swallows with little effort. However, identifying swallows is a bit more difficult than finding them, since they have an annoying habit of zipping through space like acrobatic, high-speed dogfighters, seemingly with no need to take a break or pose for curious birders. Once in a while, they will line up on power lines or perch in plain sight, but you’re more likely to find them exploding through the air like avian fireworks. Even so, there are ways we can tell them apart. Northern Rough-wings may be the easiest to differentiate, but not because they are striking or colorful. To the contrary, if you’re watching a flock of colorless, drab and buffy birds with white bellies dart about, this is the likely species. Rough-winged Swallows also are more common in early summer, and nest in holes in dirt or sandbanks. The two species most difficult to tell apart are the Violet-green and Tree Swallows, birds that are similarly plumaged, sound alike and nest singly in cavities or birdhouses. From below, they look identical, and from above the emerald green backs of Violet-green males are often difficult to tell from the blue-green backs of Tree Swallow males. Both also flash white rump sides from above, though those of the Violet-green are more pronounced. With luck, you’ll find a perched male facing you. If so, look at the face. If there is white on the cheek and above the eye, it’s a Violet-green, otherwise you’ve found a Tree Swallow. 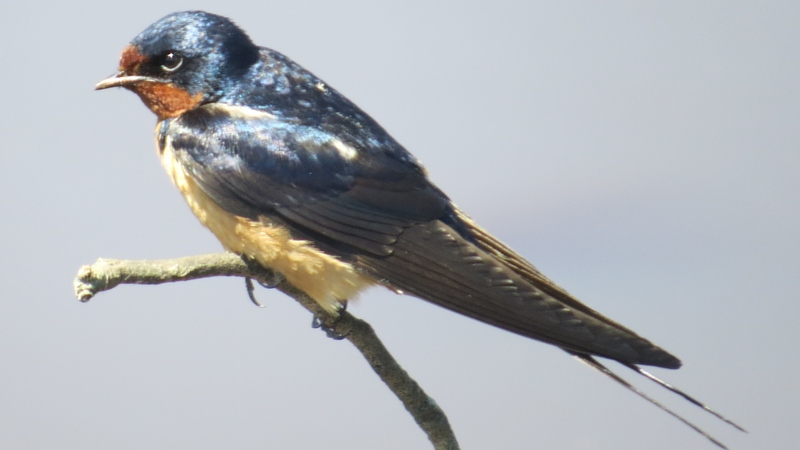 Identification gets easier with Barn Swallows, elegantly long-winged birds with deeply forked tails, brilliant blue backs and rich orange faces and throats. 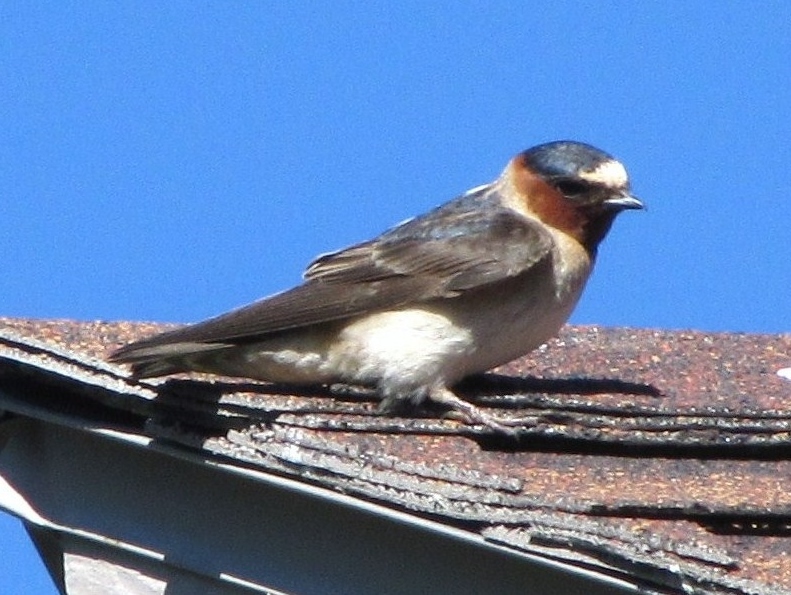 As the name suggests, Barn Swallows like to nest in barns, as well as under building eaves or highway overpasses. Their nests are neat half cups, made from mud pellets they ferry to the eaves. There aren’t as many barns as condominiums in the ski country, but Barn Swallows have adapted well to the many condos that populate Summit County. Under the eaves of these buildings, you’ll find neat rows of Barn Swallow nest-cups. If condos look like barns to Barn Swallows, they must look like cliffs to Cliff Swallows. These swallows are fairly easy to identify, as well, with dark crowns, white foreheads, orange necks and short square tails. 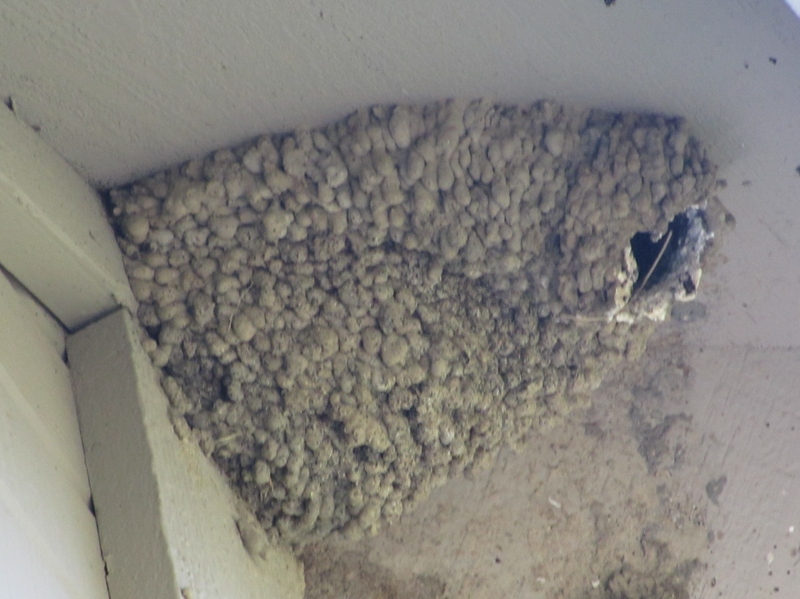 Cliff Swallows also build nests from mud pellets, but instead of little half cups, they construct larger jug-like structures in a colony of nests. Unafraid of heights, they build these precarious-looking nests under the highest eaves available. Leaning out from my third story condominium deck in Keystone, I watch the construction of these nests at the top of my building high above the Snake River, and wonder what goes through the mind of a fledgling when he peeks out at his first flight challenge. Vertigo is obviously not found in a Cliff Swallow’s genes. Watching swallows tirelessly sweep creeks and shorelines for insects may be dizzying, but it’s also mesmerizing and relaxing, whether or not you can identify the birds. And if your summer sweetheart disappears with the birds this fall, remember that at least the birds will be back next spring. This entry was posted in Birding Colorado and tagged Cliff Swallows, San Juan Capistrano, Summit County Colorado, Swallows. Bookmark the permalink.